Justin Hibbs’s practice picks apart the mechanics of spatial perception and representation, drawing upon social, political and aesthetic agendas encoded within architectural structures. Much of his work is a renegotiation of the visual language and ideological legacies of modernism, probing real and idealised notions of space. 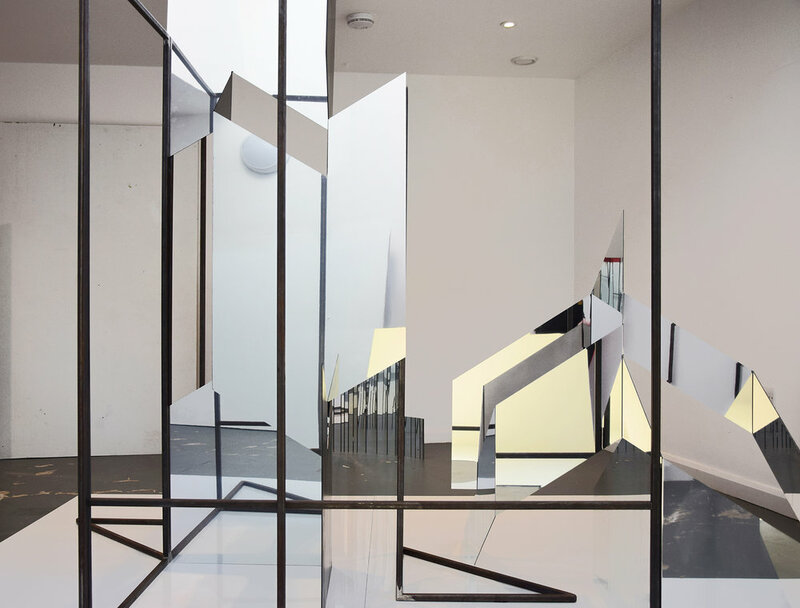 This is enacted through a uniquely multi-disciplinary approach that incorporates painting, drawing, sculpture and architectural interventions. “Travelling through Hibbs’s species of spaces, passing between dimensions that echo, self-sample and glitch, one might grasp that the whole, overarching the individual works and what they refer to, is a situation, a system, a cybernetic totality, always something else that one might click through to. The result is a model of art making, and particularly exhibition making, that when inhabited so that that the individual artworks cohere into one pulsating larger one, feels simultaneously inventive and a little frightening, since it’s tied to proliferation, not closure.” Martin Herbert 2015. Justin Hibbs (b. 1971) studied at CSM, London (1991-94) He has exhibited his work both nationally and internationally and has also curated a series of artist-led exhibitions. Solo shows include: Between Before and After at Arroniz Arte in Mexico City (2018), Alias_Re_Covered (2015) at Carroll / Fletcher; PARA/SITE (2013) & Secondary Modern (2010) at Christinger De Mayo gallery, Switzerland; Altneuland (2007), Lucy Mackintosh Gallery, Switzerland; Metroparadisiac (2006) and I'll Wait for you (2005) at the One in the Other Gallery, London. Recent group exhibitions include Rules of Freedom, Collyer Bristow Gallery, Shapeshifters,Arthouse1 London; Abstraction I, Arroniz Gallery, Mexico, Pencil/Line/Eraser (2014), Carroll / Fletcher, London; Superstructures (2013), Arroniz Arte, Mexico City; Oh My Complex, Kunstverien Stuttgart, Germany.